Let me start out by saying that this entry does have a happy ending. If you read the blog entry for 10-6-13, you may recall that in Denver, just two miles short of the official finish of our Park-to-Park Tour loop of the 12 National Parks, Jean noticed that there was an unusual amount of white “smoke” coming out of Jenny’s tailpipe. In the excitement of reaching the location where the original Tour party concluded their tour, I dismissed Jean’s observation as nothing too serious. It did not appear to be oil smoke, but rather, water vapor. I had kind of written this off as the normal vapor one sees on a cool afternoon – perhaps exaggerated by the poor idle performance that we were experiencing at Denver’s 5,000 foot altitude. First indication of engine problem – smoking tailpipe at termination point of the 1920 Park-to-Park tour in Denver. However, later that afternoon when Jean and I arrived at a Denver church for Sunday evening Mass, the level of vapor exiting form the tailpipe was embarrassingly high. So, as on two previous occasions, I entered the church totally preoccupied with car challenges; this time thinking about potential causes of the steaming tailpipe – none of the options I could think of were trivial. There are only a couple of traditional ways that coolant can get from the cooling system over to the combustion side of the engine; either through a blown (failed) head gasket or through a crack in the engine head or block. The former requires removal of the head to replace the gasket – a relatively straightforward one-day project if you have the parts and proper tools. The latter most likely means trying to find and totally rebuilding a used replacement head – probably a several day project considering the difficulty of first locating a suitable head. I had taken great care in preparing the existing head during the recent engine rebuild. A very talented engine builder had prepared the head and installed the valve assemblies. During engine assembly, I had carefully selected and mated the components of the rocker arm assembly for proper clearances. I shuttered to think about undoing all that work. I had also taken care to prepare the head and block surfaces before installing a correctly positioned head gasket and torquing the head bolts in the proper sequence during the engine rebuild and after a 500 mile break-in. I really did not want to go through that routine again – especially 1,500 miles from home. We confirmed the leakage of coolant into the cylinders was the problem by noting that the level of vapor was greatly diminished when we took pressure off the coolant system by loosening the radiator cap. Apparently the violent backfire that we experienced on our way out to Denver, the two overheating episodes that we experienced in the west due to a malfunctioning thermostat, and/or the heavy demands that we put on the engine clawing our way over the western mountains had done our Jenny in. It is almost theatrical the way she held on until the day we completed the Tour loop before giving out. I guess I came to my senses sometime in the wee hours of Monday morning. I was up at 6:30am googling “Denver Jeep repair”. One should remember that Denver covers a wide physical area, with many independent cities abutting its borders. It would have been convenient to select a repair facility closed to our location on the southwestern side of the metropolis; however, the most important thing was to get the Jeep fixed correctly and if possible, expediently. One shop, several miles south of our hotel, stood out as a place to investigate. They had been in business since the ‘70s, specialized in Jeeps, and had machine shop services. When I called, the capable young lady at the service desk did not seem put-off by the age of our vehicle or our desire to have it attended to as quickly as possible. Jean was relieved to hear that I wanted to have them look at the Jeep before using the magic potion that I had purchased the evening before. Using the same logic as she did when we encountered our serious problem in Kentucky at the beginning of the Trek, she began to investigate rental car and hotel arrangements closer to the repair shop’s location. We packed up and gingerly made our way down to the candidate Jeep repair shop, with radiator cap loosened to minimize intrusion of coolant into the engine cylinders. Having been disappointed by some other repair locations during the Trek, I was very apprehensive regarding what we would encounter. Turns out, it was a first class, clean, and professionally operated facility. We were met by the owner and two of their technicians. 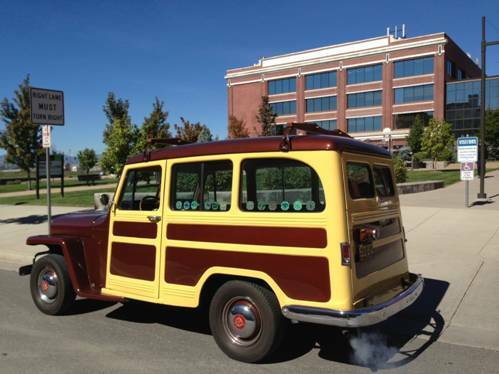 They were all familiar with older cars and the Willys Overland Jeeps. The fellow assigned to our project was actually one of their engine builders with many years of F-Head engine experience under his belt. From the symptoms, they were quite certain it was a blown head gasket (the likelihood of a cracked head considered somewhat remote) and asked us to leave the Jeep with them for a few hours during which time they would assess the problem. Here is where it got tough for me. I have been babying that Jeep for 36 years. It has only been out of my sight twice for painting and once for a differential refurbish). So, I had been planning to set up office in their waiting room for the duration, ready to answer any questions and offer advice at will. However, this was not the way they liked to operate. Before we were aware, the service desk attendant made arrangements for a rental car to get us away out of the shop and off to a convenient hotel. And so it went; my inquiries over the next two days were met with oblique responses as they assured me that they would treat “my baby” and their own. I was not a happy camper for that two days (sorry if some of my blog entries during that time are a little starchy). However, in retrospect, they were taking the exactly correct measures – some of which I would undoubtedly disputed in the interest of time and cost had they let me interfere. They did indeed find that the head gasket had failed. However, the extremely attentive technician did not stop there (as I would have). He disassembled the head, had it Magnifluxed for cracks and checked for flatness; and noticing leakage past two of the intake valves during a vacuum test (possible due to the overheating episodes), reseated the valves. He took great personal care with the repair work and also fixed a problem that I was having with the carburetor’s idle circuit. The repair was not inexpensive; but I must say was commensurate with the quality and service that we received. It only took a few hours driving east from Denver driving through a windstorm on open prairie knowing that the best possible care had been taken not only to repair the damage, but also to insure that no other issues remained, for me to justify the dent in my wallet. And, they had completed the work in 48 hours with no advanced notice. Turning lemons into lemonade: So, as we start the trip back to North Carolina we are aware that in spite of my best efforts to have the jeep in absolute top-notch condition prior to the trip, owing to our “adventures” on the Trek we now had a vehicle with a properly functioning thermostat, properly terminated distributor and generator ground wires (did not tell you about the generator on yet), a strong fuel pump, a new muffler, balanced tires with new valve stems, a repaired carburetor and an engine top-end that has been expertly examined and reconditioned. This should not only get us home, but put us in great shape for our next Trek – where ever that takes us.